Eilean Donan is located in the village of Dornie in the Highlands area known as Kintail, poised on a small island in Loch Duich. 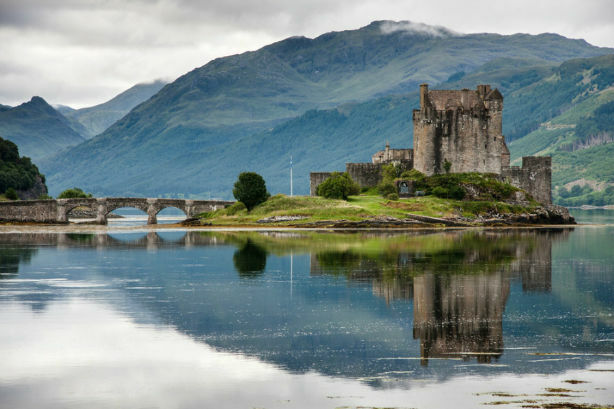 When one visits Scotland, you can't shop without seeing the image of Eilean Donan Castle—and not just on postcards. The image of this beauty appears on everything from shortbread boxes to calendars to CD covers. The unspoiled setting for the castle is perfect—a deep blue green loch surrounding it, the haunting mountains of Kintail in the background, and breathtaking sunsets. This castle simply doesn't make a bad picture! Eilean Donan is also a movie star, appearing in such movies as Highlander starring Christopher Lambert and Sean Connery, and the James Bond film Golden Eye starring Pierce Brosnen. The latest movie using Eilean Donan is the 2008 film Made of Honor starring Patrick Dempsey. Eilean Donan Castle was built about 1230 as a fortified structure by King Alexander II. The name means the Island of (Saint) Donan, an early Christian missionary who may have settled here as early as the sixth century. His well, which was presumably the reason for settlement at this location, still runs with fresh water while the island itself is surrounded by three lochs (lakes) where the water is salty—a miracle to this day. The castle has had many different occupants but is best known for its associations with Clan MacKenzie and Clan MacRae. Many battles have been fought for it, against it, and around it. This led to the naming of the Clan MacRae as MacKenzies' shirt of mail because of both fierce loyalty and fighting skills. Generations of MacRaes served as Constables of the Castle under the MacKenzies. In 1719 during one of the Jacobite risings, the castle was attacked and was largely destroyed . For 200 years it stood ruined and alone along the shores of Loch Duich. 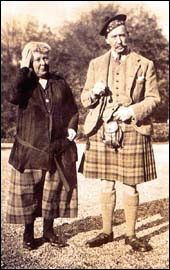 Eilean Donan was rebuilt in the early 20th century at a cost of 250,000 pounds by Colonel John MacRae-Gilstrap (shown in the photo at the left with his wife) who began again the tradition of a MacRae Constable. His great granddaughter, Baroness Miranda MacRae (Gilstrap) Van Lynden is its Current Constable. "When Lt. Colonel John MacRae-Gilstrap purchased Eilean Donan in 1912, he never intended to do anything other than keep the castle as a ruin. But thanks largely to Farquhar MacRae, the Colonel decided to go ahead and restore it. Farquhar MacRae was a highly skilled stone mason and he was employed initially only to clean up the site. But when my husband's grandfather came home from the First World War, he found that Farquhar had gone much further than simply cleaning up a bit. He was all set to rebuild. He claimed to have had a dream in which he saw, in the most vivid detail, exactly the way the castle originally looked. Fortunately, Lt. Colonel MacRae-Gilstrap married a very rich lady, Ella Gilstrap, and luckily, she was as enthusiastic as he was. So, with her money and their combined enthusiasm, they rebuilt the caste over 12 years between 1920 and 1932." "The extraordinary thing is that after the restoration was completed, the plans for the castle were discovered in the archives of Edinburgh Castle, and lo-and-behold, they were exactly as Farquhar had dreamed them to be! 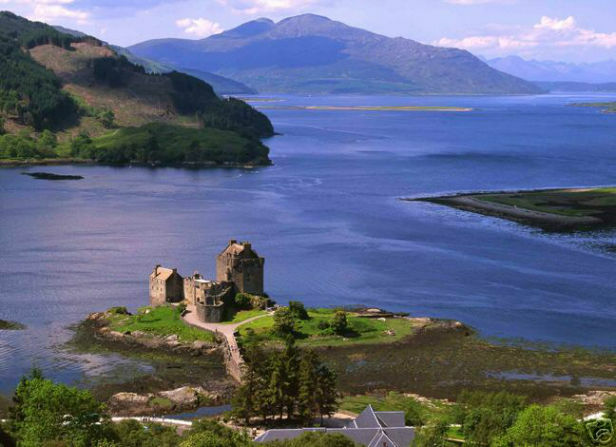 That is why Eilean Donan Castle is known as the Castle of Dreams." The renowned Scots poet John MacRae wrote "When Poppies Grow in Flanders Field" to commemorate those who lost their lives in World War I. This poem is engraved on the WWI memorial cairn at Eilean Donan Castle. Today, Eilean Donan Castle is managed by the MacRae of Conchra Trust and is open to visitors, along with a modern restaurant and gift shop. 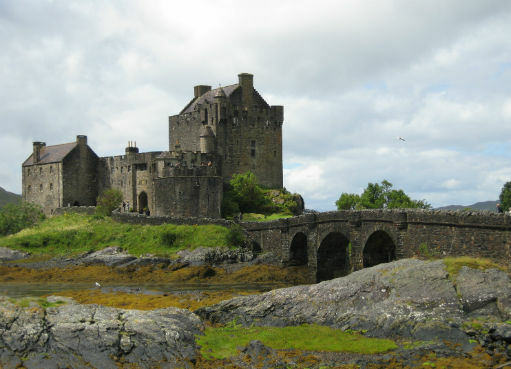 For more information, visit the Eilean Donan Castle web site.